Striker David Parkhouse has scored three goals in Derry City's last four games. City go into the game full of confidence having won their last four games, while Harry Kenny's side are unbeaten in their last two games, after defeating champions Dundalk a few weeks ago, before drawing at Cork City on Friday night. 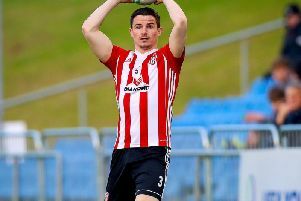 The Derry Journal are again doing a live blog from tonight's SSE Airtricity League Premier Division clash between Derry City and St Patrick's Athletic, including fans' predictions, updates, reaction and much more.